* Celluclay, the first name in instant papier mache just added on to the family. * A new fast setting formula for those times when you don't want extended dry times. * Still non-toxic, still 100% safe in every way. * Larger pieces and techniques requiring quick set up times are easier with Activa's new Fast Mache. * Minimal shrinkage adds to the versatility of uses for Fast Mache. 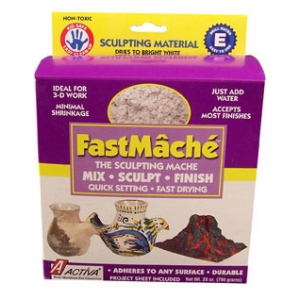 * Heavier and with a tougher finish than the original, Fast Mache is ideally suited for 3-D work and is perfect for all of your school project needs. * Fast Mache also works well with Activa's Rigid Wrap and Activ-Wire Mesh.